Buying a jewelry box involves more than just going to the store and buying the first one that you see. Jewelry, even costume jewelry, is an investment, so when you look for a jewelry box, it is important to buy a jewelry box that will protect your investment. At ChasingTreasure.com, shop jewelry boxes that meet the needs of every jewelry connoisseur and every jewelry collection size. Choose from styles for women, men and girls. Our wooden jewelry boxes are some of the best sellers on our website. Browse our lined jewelry boxes in a variety of different woods, like mahogany, rosewood, walnut, oak, bubinga, maple, cherry, ebony, and many others. In addition, you'll find jewelry boxes that have been painted white, lime green, bright blue, pink, black, and many other colors, too. Several of our wooden jewelry boxes come with beautiful and intricate inlays that make them look like treasures from by-gone eras. The wooden pieces with inlaid details look lovely on the screen, but they look even better in person. When your wooden jewelry box arrives, you will be pleased with your purchase. If you prefer a jewelry box in a softer material, consider several options in leather. Many of our leather pieces are designed for travelers who need to bring some jewelry pieces along. Even though the leather cases are designed more for traveling, they do make nice pieces for easy storage in closets and dressers. Since many of the leather cases have clean windows, it is easy to see what it inside while keeping the pieces protected from dust. When you look for the perfect jewelry box, it is more important to be concerned with the inside design rather than the exterior appearance. The goal of a good jewelry box is to protect your jewelry, so you should choose a jewelry box that is designed for the jewelry that you have. Most wooden jewelry boxes and leather cases are lined with suede, satin, or another high quality textile. If you wear your jewelry frequently, it is a good idea to buy a lining in a more durable textile, like suede. A lighter color lining will show more wear from the oils and dirt that gets on jewelry through every day wear. Each jewelry box is designed for different types of jewelry. 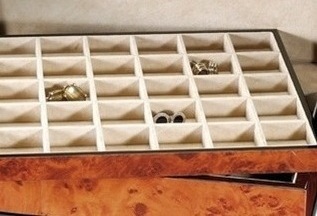 There are some boxes that have spaces just for rings, cuff links, or small earrings. The small compartments are not designed for necklaces or bracelets because of the fact that the small chains can easily get tangled. In addition we carry boxes that are designed just for watches. Many of our wooden jewelry boxes have multiple compartments with varying sizes for different types of jewelry. Some have drawers that slide open and cabinet doors that open to allow necklaces to hang from hooks. The traditional wooden jewelry boxes are table top boxes. These look like small chests that traditionally either open from the top or from the front. Some of the newer designs open like cabinet doors. No matter what table top design you choose, you will notice quickly that they all have uniquely styled hardware that helps match the boxes style to your home. Some have Asian style hardware, while other boxes have traditional drawer pulls. Some boxes have modern bars and others have island-style hardware. Detailed product descriptions let you know what metals the knobs and handles are made from and what decor style they are designed to match. Many of the wooden jewelry boxes are neutral in design so they can easily fit in most homes. 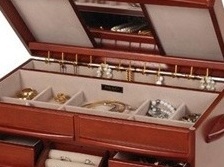 Men and women who have large collections of jewelry often invest in a jewelry armoire. These are free standing furniture pieces that have more space that the typical jewelry box. They usually open at the top and have a mirrored lid. Some have trays that can be removed from the top, too. Most jewelry armoires for women also have several drawers with compartments in varying styles, so you can easily store scarves, lingerie, rings, bracelets, watches, pins, and other pieces in their appropriate places. Then most jewelry armoires also have doors that open for necklace sections with hooks and pouches to safely hang and protect your favorite necklaces. While the free standing armoires cost a bit more than the typical table top jewelry box, they are worth the extra money because they are very attractive and they store a large amount of jewelry in a very safe place. Because our jewelry boxes and armoires are so attractive, many of our customers have difficulty choosing the best box for them. If you have questions about certain boxes or you are trying to narrow down your choices to fit your needs, we invite you to give us a call or send us an email message. We will respond quickly to help you make your choice. Many people do choose the best jewelry box for their purpose or gift occasion ox based on the exterior appearance, then they look to the compartments on the inside. One of the most popular and most distinctive looking boxes are designed in maple. Our maple jewelry boxes come in so many different varieties and color tones, it can be challenging to see how the wood designs are related. Some of the wooden boxes have a warm tone and some have a neutral tone that looks great in modern homes. Our wooden mahogany boxes have a sense of personality. The dark wood has a smooth grain, which makes it quite popular with fine furniture. It makes a nice wood for storing jewelry because the bright metals look bold and bright against the dark wood. Most of our mahogany pieces come with a dark, burgundy-purple lining to add to the depth of the jewelry box wood craft. Besides the large line of wooden jewelry boxes in a variety of shapes and sizes, we have several jewelry boxes that are considered to be artistic pieces. They are handcrafted by artists who enjoy working with small detail and they spare no expense on the exquisite craftsmanship that they put into the boxes. We call this line of handcrafted boxes our luxury line because of the high quality textiles and detailed inlay work. Many of our luxury wooden boxes have handcrafted curves or other details can be difficult to craft. If you do not want a wooden jewelry box, we also have a collection of luxurious jewelry cases in leather that has been worked with by hand. If you are looking for jewelry boxes for certain types of jewelry, we have boxes designed just for one kind. Our store features a line of bracelet boxes for women in attractive wood with decorative trim. These wooden boxes are perfect for bracelets made of chains rather than bangle bracelets. If you need to store your bangle bracelets, we have a stacking set of boxes in varying square shapes. You'll also find boxes designed just for earrings, with small compartments for stud and smaller hoop earrings. If you wear more dangling earrings, choose tall jewelry boxes with places to hang your dangling earrings. Many of our earring boxes also work nicely for rings, but we offer special boxes just for rings. One of our best sellers is a ring holder that is shaped like a high-heel shoe with rolls for storage. Necklace storage tends to take more room that earrings and rings, because necklaces need to hang. Most of our necklace storage boxes have hooks and pouches to protect necklaces from getting tangled and broken. Most jewelry owners like to keep their favorite silver pieces safe from tarnish. For this you'll want to purchase one of our exclusive jewelry boxes that are lined with special textiles that are treated to protect silver pieces from touching each other and from tarnishing. It is important that you keep your silver jewelry in a dry environment. Helping making your jewelry care easier is our goal, so if you have several pieces of silver, we recommend a jewelry box just for those pieces. Jewelry is an investment and it is important to keep it safe from harmful handling and elements. Jewelry boxes with locking mechanisms keep prying fingers away from your special pieces. Most of the locking jewelry boxes are wooden table top or armoire designs, but we also have leather locking boxes that are designed for travel. If you need to bring your jewelry with you on the road, it is important to be able to lock the tops and drawers and we offer a variety of sizes and price ranges to meet everyone needs. When you are in the market for a jewelry box for a teen or young girl, we have youthful jewelry boxes to help them store their favorite pieces of jewelry. We specialize in ballerina music boxes, and the styles of our musical jewelry boxes have moved beyond the simple box with one compartment and a twirling ballerina. The beautiful music boxes for girls come with drawers with specialized compartments, doors for necklaces, and rolls for rings. If you prefer to buy a silent jewelry box for your favorite girl, we have several boxes that are more appropriate for teens and girls. Many of our painted white wooden boxes look great in girls bedrooms; these smaller white boxes are lower in price than the more expensive, larger armoires and table top boxes for women with large collections of fine jewelry. Your teen or younger girl will feel special keeping her jewelry pieces in a beautiful box from Chasing Treasure. We are proud to feature jewelry boxes for women and men by highly regarded manufacturers. We carry all styles available by Reed & Barton, a company that has been manufacturing jewelry boxes for nearly 200 years. Their traditional designs often feature sterling silver or other well-made details. We also sell many wooden jewelry chests and boxes from Giftware by Jere. The company has been importing and wholesaling beautiful jewelry boxes and gifts for almost 40 years. They provide many gifts and jewelry products to companies like the Smithsonian Museums and the Army/Air Force Exchange Service. Another one of our popular brands is Mele Jewelry Box Company. This company transitioned into making jewelry boxes after the Great Depression when they made the boxes that presented the Purple Hearts to soldiers; fortunately, they stayed with making jewelry boxes and they are still making them today with over 100 years of experience in the industry. In our store we also offer jewelry boxes from Seya, Jewelkeepers, Wolf Designs and many more. As you shop for jewelry boxes, you will see that we have boxes that range in prices from under $50 to boxes, chests, and armoires that are priced over $350. The lower priced boxes tend to be smaller and made from more common wood or painted wood. They lower priced boxes also usually have fewer design details. When you move up in price, you will get more design details, bigger compartments and more specialized compartments, and less common wood with more expensive findings. Most of the armoires are in the price range, simply because they are larger pieces of furniture. We also have extremely attractive, wooden handcrafted boxes in higher price ranges, too. Whether you give a jewelry box, chest, or armoire from ChasingTreasures.com as a gift or to use for yourself, you will quickly see how beautiful they are. Even the less expensive pieces look like they are expensive treasures. When you begin shopping for a jewelry box, chest, or armoire from ChasingTreasures.com, you will see that many of our boxes come with one-year warranties. The warranties are from the manufacturer for both wooden and leather box styles. If you need more details about any of our brands, manufacturers, and warranties, we invite you to give us a call or send an email with specific questions. Most of the warranties have to do with workmanship.